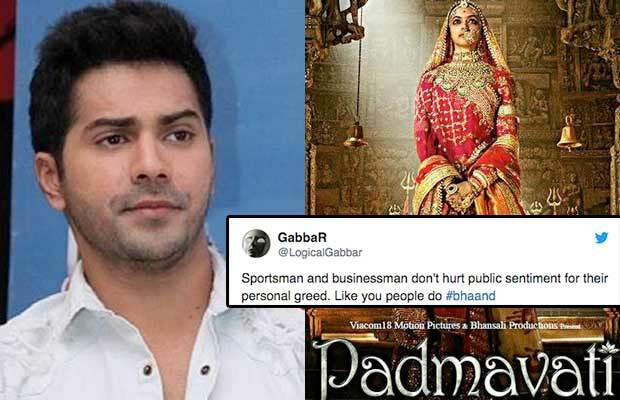 Varun Dhawan Gets Trolled For Supporting Deepika Padukone’s Padmavati, Actor Gives A Befitting Reply! Varun Dhawan had earlier made a tweet in support of Deepika Padukone’s Padmavati! While the main lead, Deepika Padukone and the makers of Padmavati have been facing a backlash from different people all over the country, there are also many who have come out supporting the film. Joining the side of Padmavati, was the Bollywood star Varun Dhawan. The actor gave a reaction to the bounties offered for beheading Deepika and Sanjay Leela Bhansali. On one hand, Meerut youth announced a bounty of Rs 5 crores, on the other hand Haryana BJP Chief Media Coordinator Suraj Pal Amu raised his amount to Rs 10 crores for doing the same thing. Well, we must say that it was an awesome reply from the actor! Talking about the film Padmavati, the makers have been forced to postpone the release date of the film due to the continuous protests, threats and violence. The film was earlier scheduled to hit the theatres on December 1, this year. But now there are even possibilities of the movie being pushed to 2018. Directed by Sanjay Leela Bhansali, Padmavati stars Deepika Padukone, Ranveer Singh and Shahid Kapoor. Previous articleBigg Boss 11: Arshi Khan Makes Dirty Revelation About Hina Khan, Here’s What Happened Next- Watch Video!